Optimised from top to bottom: new calorimeter produces good results in the test beam. Particle physics will always need calorimeters, so particle physicists are always trying to optimise, tweak and update their calorimeter systems for the best possible measurements. The CALICE collaboration plays a leading role in this, and their most recent prototype for a hadronic calorimeter has just been completed and is currently at CERN for a round of tests in the test beam. The project leaders are Katja Krüger and Felix Sefkow from DESY, who coordinated the development and production of all parts for the new prototype. They made sure it all came together in the detector lab at DESY and used the local expertise of many different groups to check that it worked wand set off with it to CERN. And it’s not only DESY electronics expertise that was involved: the calorimeter made the journey packaged in neat crates designed and custom-made by the DESY carpenters. The calorimeter prototype, whose role it is to measure the energy of passing particles from a collision, consists of 38 layers of 72 by 72 centimetres of active material. 22 000 scintillator tiles, each with its own silicon photomultiplier (SiPM), measure the passing particles, and in contrast to previous prototypes everything is included in the structure: photosensors, readout chips, LEDs for calibration, voltage adjustment, trigger, storage, amplifiers, energy and time digitisers, you name it. All of the data recorded by the detectors leaves the structure via one neat cable – just like it would have to if it were part of a complete high-energy physics particle detector where there’s no space for racks and lots of cables. Representation of particles in the detector. No image credit. Coordinator Felix Sefkow explains what makes this calorimeter so special. “It’s got the 4D position information and timing of an imaging detector and it’s a calorimeter at the same time.” The new prototype is the culmination of years of developing and testing various technologies and combinations of technologies in labs and test beams to find the optimal system combinations and use the latest developments from semi-conductor industry. With its mature technology it could in principle be installed in a detector for the ILC tomorrow. So far things have gone well in the test beam that just finished after two weeks at CERN. Assembly of the detector had started in October last year with the participation of many groups around the world, using mass-production technologies. The scintillator tiles themselves were injection-moulded in Russia, automatically wrapped like candies in Hamburg and glued onto electronics boards by a robot in Mainz. 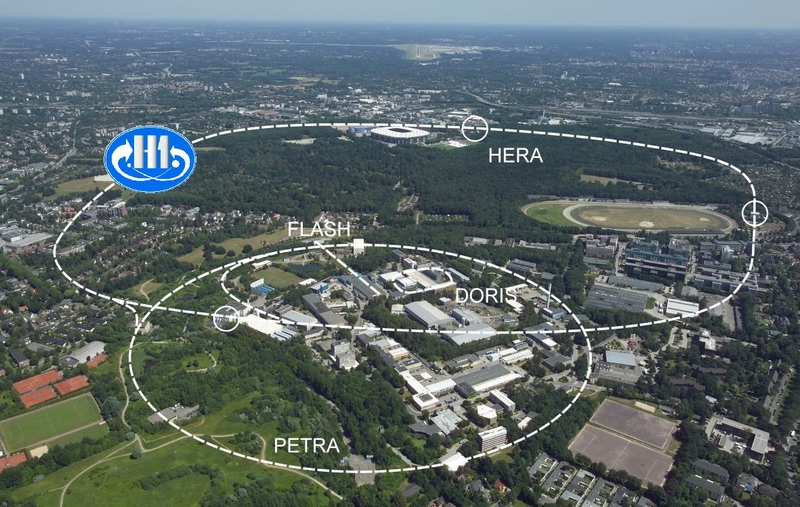 The complex boards were assembled at DESY, using ASICs from the OMEGA group at Palaiseau, tested in Wuppertal, and SiPMs from Japan, characterised in Heidelberg. The DAQ was a common effort of Bristol, Prague and DESY physicists. Board production went on until January, after which they were calibrated, tested and integrated into the calorimeter structure at DESY. The Max-Planck-Group Munich contributed to mechanics and gave the software a strong boost. 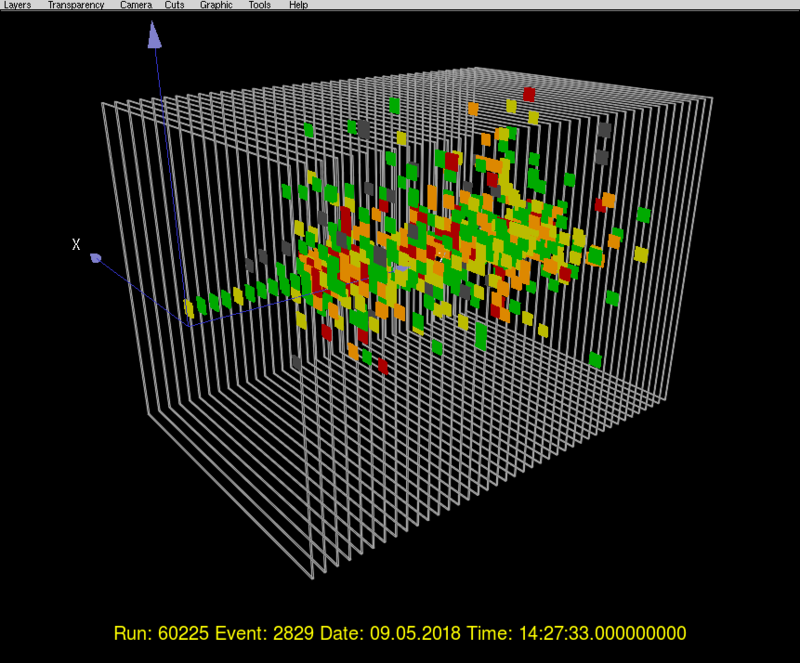 And before being packed up into boxes for the CERN beam time the setup already recorded its first cosmic muon events. Installation in CERN’s SPS beam line H2 went smoothly, the detector worked out of the box and recorded tens of millions of muon, electron and pion events. “Online data quality looks good”, summarises Krüger. The CALICE SiPM-on-Tile technology, developed under DESY lead, is so versatile that it will also be used in the LHC’s CMS detector for the high-luminosity upgrade and is under consideration for a future neutrino detector in the United States. Testing, testing… calorimeters in the test beam at CERN. Better together: two technological prototypes of the high-granularity calorimeters for a future ILC detector have been tested together with particle beams at CERN in a combined mode. 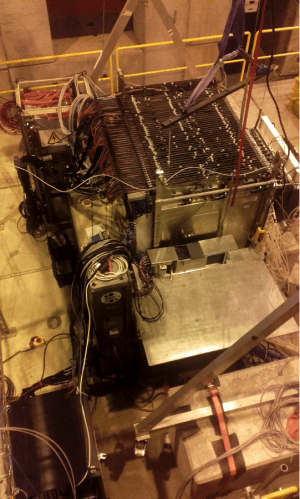 The Semi-Digital Hadronic CALorimeter (SDHCAL) prototype with its 48 layers and the Silicon Electromagnetic CALorimeter (SiECAL) with its 10 units, both part of the CALICE collaboration, spent two weeks taking data on the “H2” beam line at CERN’s SPS. The principal goal of this beam test was to validate their combined data acquisition (DAQ) system developed by the teams working on the two calorimeters. After the fixing of a few problems that appeared during the data taking, the DAQ system ran smoothly and both prototypes took common data. This is what they will have to do in the future to register electron-positron collisions at the ILC. Physicists and engineers from six countries participated in this beam test: Belgium, China, France, Japan, Korea and Spain. Future tests will focus on studying the common response of these two calorimeters to the different kinds of particles. “The success of this combined test will certainly encourage other detectors proposed for the tracking system (Silicon and TPC detectors) to join the adventure…,” Imad Laktineh, professor at IN2P3’s Institut de Physique Nucléaire de Lyon,who supervised the combined beam test, hopes. More about calorimeter test beams here and here.